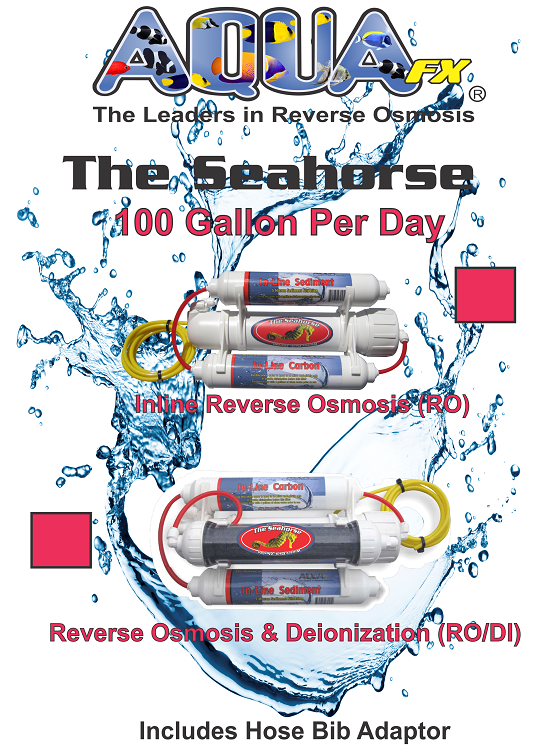 The Seahorse Compact Reverse Osmosis system, This small system can make water on the fly, easy to maintain, and portable. Ideal for Freshwater, Fish Only Tanks, Planted Tanks, Drinking and more! AquaFX has brought you the best compact Reverse Osmosis money can buy! Boasting a wonderful 98.6% Stabilized Salt rejection, the AquaFX Seahorse RO system is the premier smaller RO water treatment. Available in 50 or 100 Gallons Per Day Systems. TCF membranes made in the USA; providing the best water quality and most efficient waste ratios.